Here's what I got. 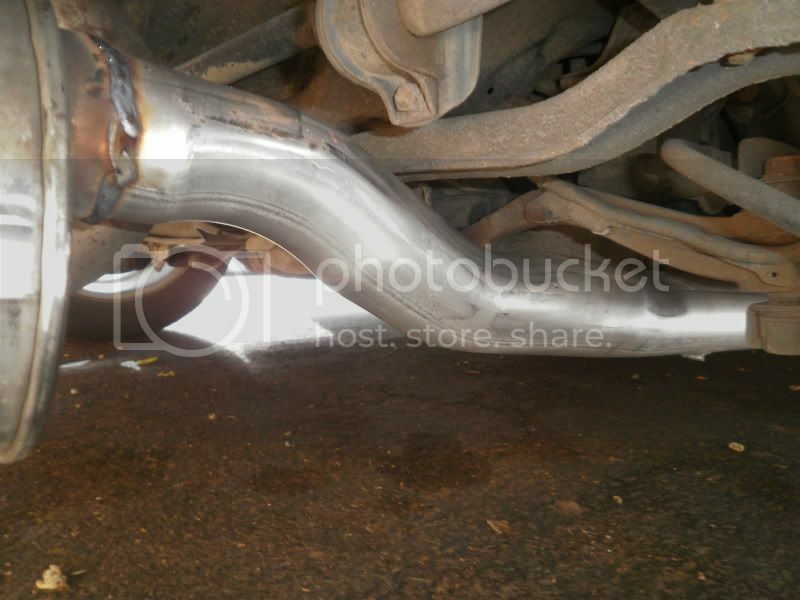 2.5" inlet, 2.5" pipe all the way around, good welds, and a 4" tip. The tip is a little bigger than I wanted, but it works for now. Took it down to have it installed, and here's where it got complex. 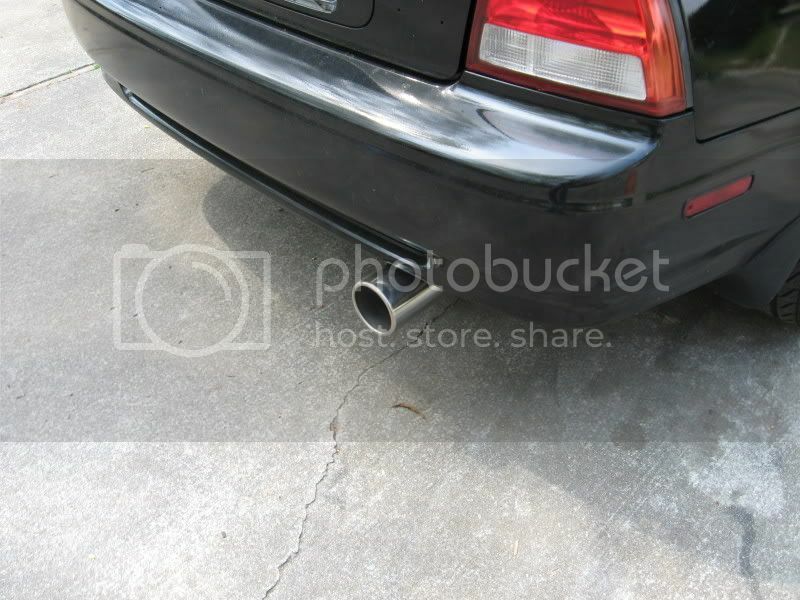 Because of the odd shape, for the inlet to line up on the bottom, the tip would be on top and the muffler would hang low. We managed to work it into place and split the difference. Slight bend in the pipe, a little low to the ground, but overall it's best performance/look. The hangers also took a little creativity to fab up, but the outcome was wonderful. Fairly well hidden and strong hold. Thanks to Jay (tech) and Sal (service manager) at Meineke #1172 for the great job. It was amazing the look on everyone's face when I pulled that muffler out of the car. They'd never seen anything like it and had their doubts, but they all loved the sound. Here's some installed pics. Sound is amazing. Very deep, and very quiet. You can hear the engine over the exhaust at high rpms. 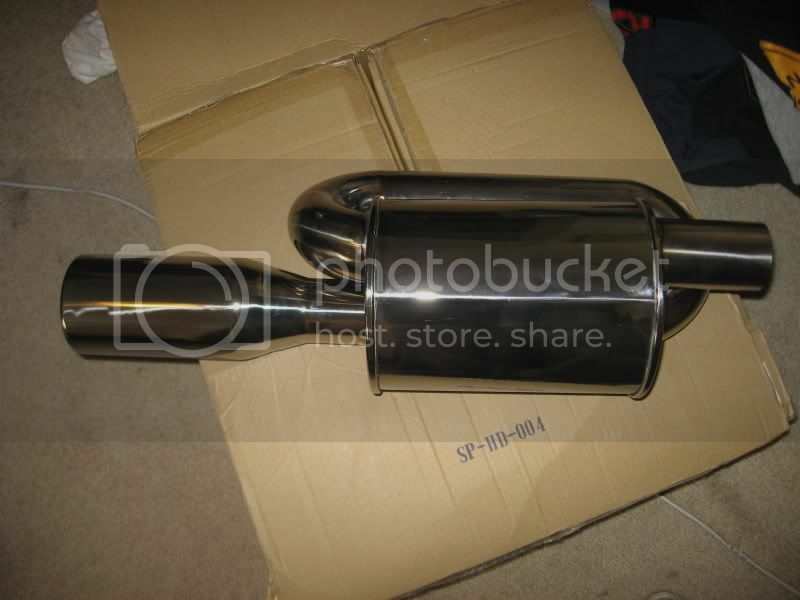 Rest of the exhaust is Megan/OBX/cheapo header, 2.5" Carsound cat, and 2.5" exhaust with 12" resonator. This is looking good and sounds great! nice man like it, how much did it cost for them to install it? 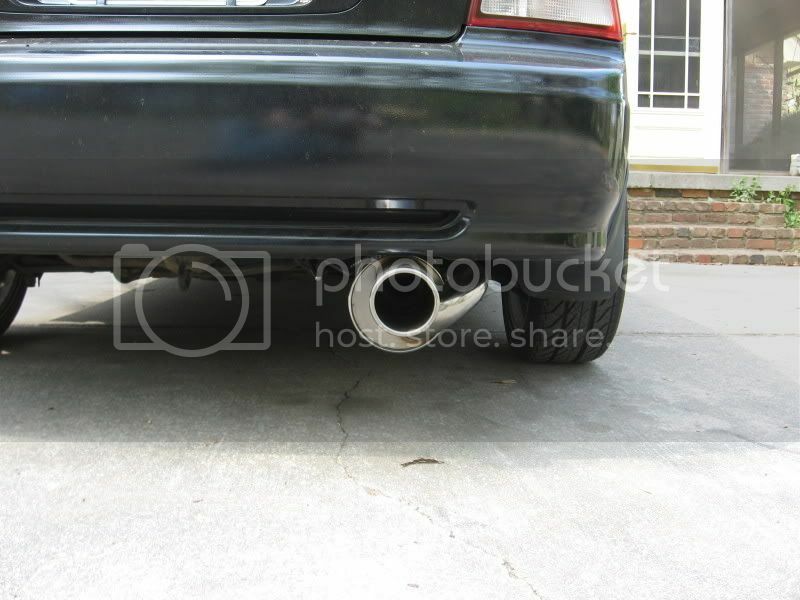 i think i might do that when i get my exhaust redone, how much would u say ur ur entire exhuast cost u? is that the OBX one or the ebay knock off??? that does look really low, do you ever hit it coming in or out of driveways? I would get this one but i dont want to look like an idiot having to swing wide and angle in everytime i hit a speedbump or driveway. it's too low for me, and i don't really like the sound. no hate though. just not for me. i do, however, love that price. 100 bucks w/ install? that's what i like to hear. What's the benefit of the second loop; is it only for sound? Remember... that's all ANY muffler is for. 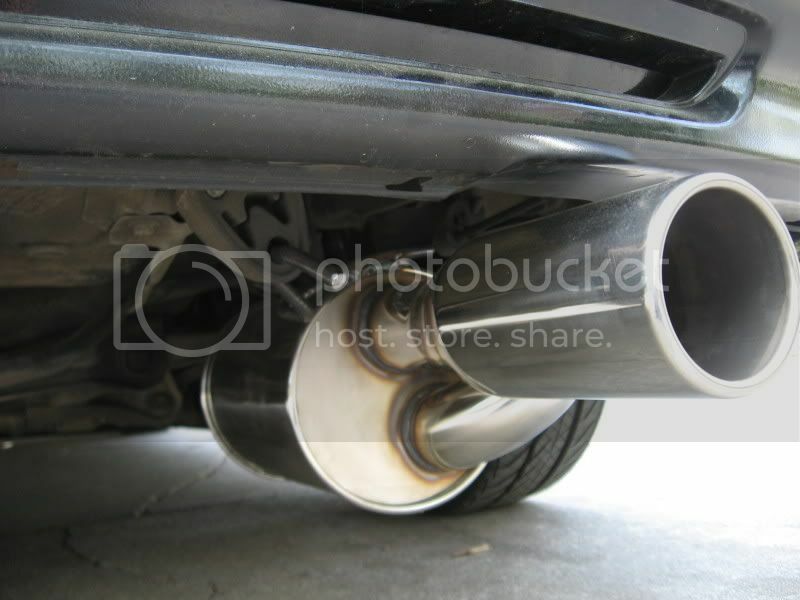 Mufflers really have no benefit at all other than changing the sound of an exhaust... they "muffle" sound. that some freaking crazy science to get into but . . .
also i should be hanging around the drunk checkin area in about 25 min if anyone wants to meet up! 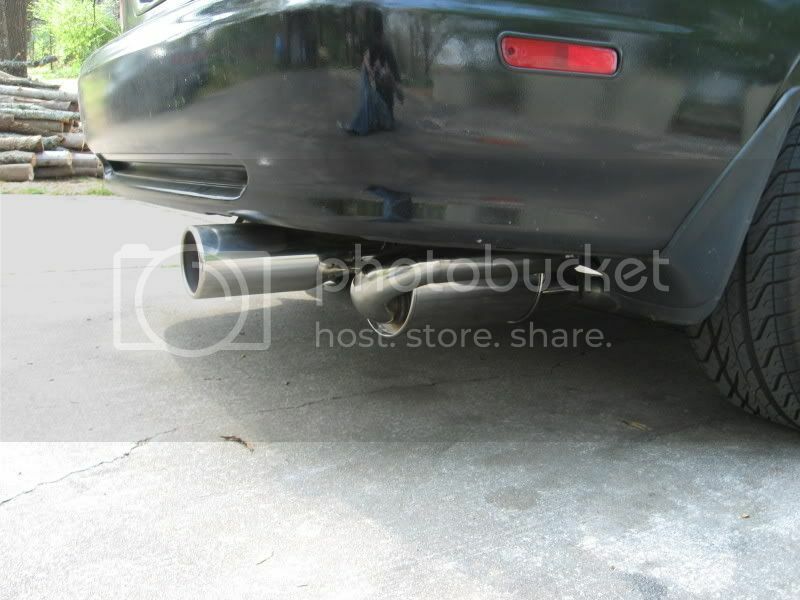 Not my favorite looking exhaust, but it sounds excellent considering the price. How has it held up over time? I also got one of the ebay twin loops. As said the quality is pretty amazing considering it's a knock off. Mine was also mounted a little low due to the inlet and outlet positions. The sound is wonderful IMO. Here's mine @ WOT. Crappy phone vid quality, but you can get the picture. I got the OBX R twin loop on ebay and had it welded on with 2.5 inch piping and a resonator and Im in love with it. My exhaust note paired with my intake growl is intoxicating. ^^^^Good to know. ALthough after it being on a while now, I gotta say, it is getting louder. I dont know if I've got a leak now or the muffler is fuggin up. Will update when I find out.